These Crisps were firm and wholesome. The crunch was evident in its muted grounding bang, rather than the crispy snappy crush that you find with more thinly cut Crisps. 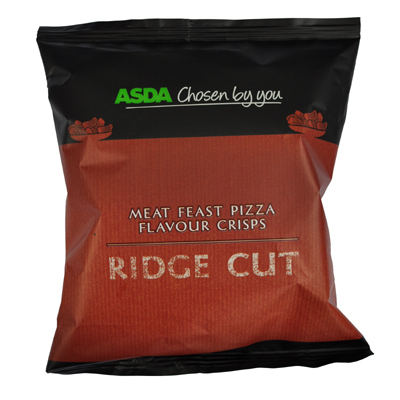 These were thick cut Ridged Crisps. The ripples were medium in width. Most Crisps were heavily seasoned with an orange colouring. Closer inspection revealed some tiny coloured flecks sporadically placed on each Crisp. A Nose Plunge Test suggested a sort of barbecued meat aroma. There was also something sweet going on. We were ready to sneer, but much to our surprise, the Crisps did taste of Pizza. A study of the ingredients list explained that included was Meat Feast Pizza Flavour! The food science geniuses have created this from the following ingredients: Sugar, Salt, Onion Powder, Tomato Powder, Yeast Extract, Wheat Flour, Cheese Powder, Natural Flavourings, Ground Black Pepper, Ground Fennel, Oregano, Ground Basil, Paprika Extract, Lactic Acid). Interestingly, the overriding taste was slightly spicy and sugary meat, but it definitely reminded us of Pizza.